Conditions were just perfect this morning. Still and cold with a hard frost. I asked Rob what stand he recommended and he told me he would hunt the stand I spent last evening in. I was a little reluctant. The stand is a poke - almost 30 yards to the bait. And there is zero cover. But I did see my best buck there and Rob thought it would be a great place to hunt with a North wind. I rarely 2nd guess my guide so I went with his suggestion. Turned out to be a smart move. Rob dropped me off early in the morning and within 30 minutes deer started to come in. They were all does and the rut is a ways off, but deer in the area are still better than nothing. At 6:50 AM I could hear a deer approaching from the swamp. I turned my head and could just about make out a form with antlers. He walked within 20 yards of me and I could clearly tell he was a giant bodied deer, but all I could see was his left beam. He looked great but I needed to see the full rack. I cautiously lifted my binoculars as he jumped the low-barb wired fence and approached the does. There was plenty of light for my glasses and when I saw him my heart started pounding. He was a great buck. I guessed him at 4.5 years old with a massive 8pt rack. He was a not only a shooter, he was a trophy buck. I had a longer shot than I am used to for whitetails - 28 yards. But I was confident I could make it. I just needed to get to full draw - and get the shot on video at the same time. No small feat. The stand at this spot is wide open, no cover. 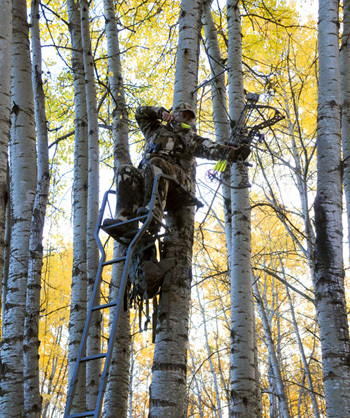 It is a ladder stand in the middle of a poplar stand. The deer know something is up. This buck was no different, he knew something was out of place in the trees and he gave me a look more times than I care to think about. I was patient. I had my video camera rolling and I quietly shifted position in the stand for the shot. 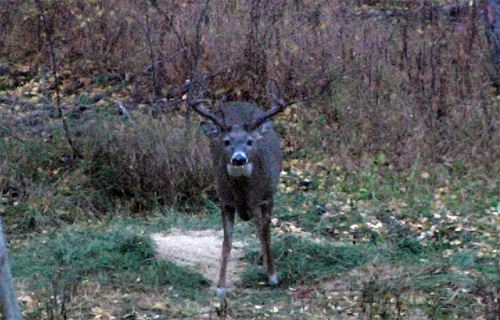 The buck was on to me, but not enough to run off. I waited for just the right angle. It was a long shot for me. When the buck turned I drew and put my 20 right on his lungs. 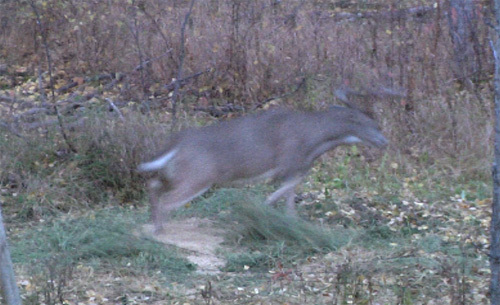 I know that a semi-alert buck will drop at the shot and this one was no different. At release, the buck dropped several inches. Good thing I aimed as low as I did. The deer ran straight west but only for 20 yards. He went down in 5 seconds. One of the fastest kills I've ever had. 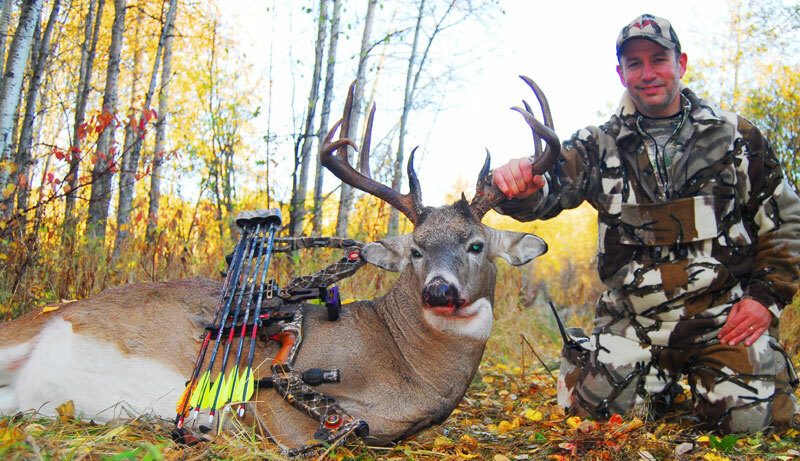 My Carbon Express arrow tipped with a Muzzy Phantom MX 2-blade head put this giant buck down in a hurry. I knew I had just killed a great big Saskatchewan buck with a perfect shot. To say I was happy would be quite the understatement. I called Rob on the 2-way and he showed up 40 minutes later. We tracked the buck together while his assistant guide, Tom, carried my video camera. 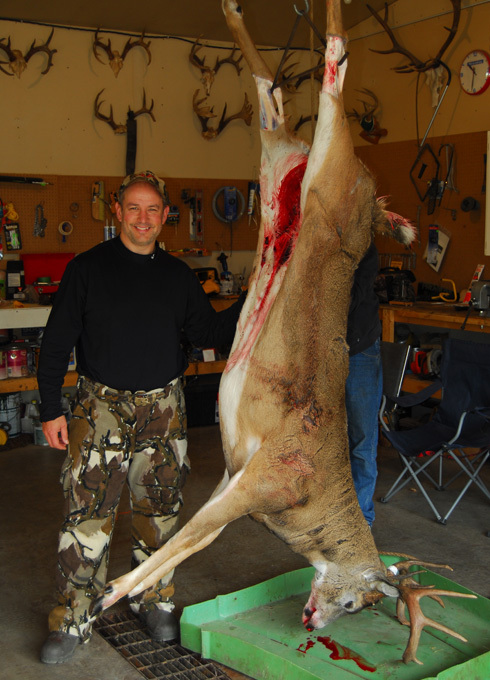 The buck was better than I first thought, and far bigger (body wise) than I had imagined! 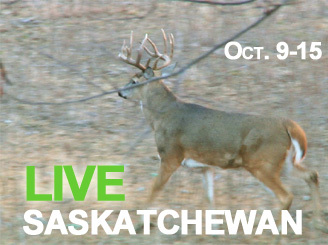 These Saskatchewan bucks are true giants. We later weighed him with a scale. 300lbs on the hoof and 245lbs dressed! We scored him later that afternoon. See if you can guess his gross score? This was my second trip with Rob and my 2nd buck. However this one was far more representative of the quality they have here at Canadian Trophy Quest. I strongly urge bowhunters to give the archery season a shot here. The bucks are far more predictable and un-pressured. 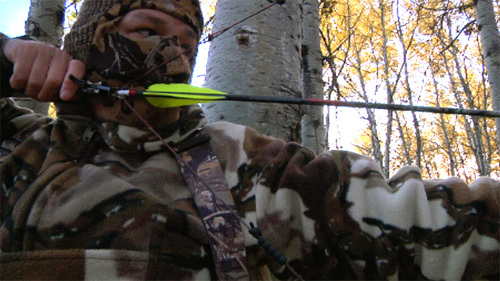 Rob has thousands of acres of land to hunt and none of it has any pressure whatsoever. This is not leased land either, it is a combination of public and private ground. Leasing is illegal in Saskatchewan. This is a whitetail hunters' dream. This is my best eight point to-date and the best part? he has that classic black horns that are prevalent here in far north Canada. If you are looking for a fantastic hunt with incredible trophy quality and the chance at a real giant, give Rob Nye a call. I can't wait to come back!